"Michel Guignier is a fourth generation vigneron in Villié Morgon, in the heart of the AOC Morgon appellation in Beaujolais. Following in the footsteps of the famed "Gang of Four" in Morgon, Guignier is committed to producing wines in the most natural way possible in order to both protect the environment and create wines that are alive and transmit a sense of place. He is in the process of slowly converting his estate to full organic certification, though has been planting grass and herbs between the rows as well as ploughing and composting for many years. The Morgon appellation is characterized by soils of decomposed granite and crumbly schist referred to regionally as "rotten rock". Many of Guignier's vines are up to 70 years old, all are tended by hand with yields kept to a minimum. Guignier feels that when grapes arrive at the cellar at full physiological ripeness then you have everything you have to make a top wine. As such, grapes are picked entirely by hand and rigorous sorting is done both in the vineyard and in the cellar before the grapes go into cement vats for vinification. Guignier follows a traditional vinification "à la Beaujolaise" with no de-stemming and with only indigenous yeasts used for the fermentation. The wines are macerated for 6-7 days for the Beaujolais and up to 14-15 days for his top Morgons. Guignier uses a vertical wooden press that slowly and gently presses the grapes. After pressing, most of his wines are returned to cement to finish their alcoholic and malolactic fermentations. His top cuvée, the Morgon "Bio-Vitis", however, is raised in neutral burgundy barrels. The élévage is between 5 and 15 months depending on the terroir and the quality of the vintage. Vintages with more tender, forward fruit are bottled a bit earlier, while the more structured years receive a longer time in vat or wood before bottling. Guinier uses minimal doses of S02, though he prefers to add it after the malolactic rather that at bottling as he feels it integrates better into the wine. He also makes several cuvées for the French market that are made entirely without sulphur at all. Guignier's wines display that transparent, ethereal, soil-driven quality that makes naturally-made, top Beaujolais so unique and joyful to drink. Among them are a fresh and charming Beaujolais AOC made from 50 year old vines, a rich and well structured Morgon Vieilles Vignes from 60-70 year old vines, and the complex and seductive Morgon Bio-Vitis made exclusively from fruit from La Roche Pilée, a south facing vineyard of pure, decomposed rock located at the base of the Cote de Py. 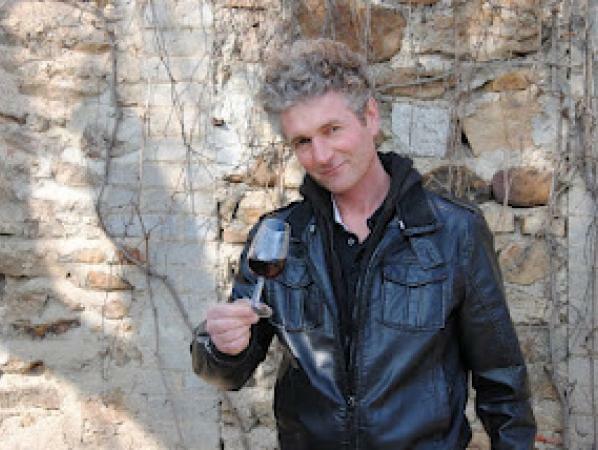 Michel Guignier is clearly a rising star who will soon join the ranks of the many luminaries in the village of Morgon." James Suckling 95"The intensity and nature of this wine is so impressive with aromas of blue slate, wet vine bark, fresh mushrooms and cherries. Full-bodied, dense and layered with ultra-fine tannins and a glorious finish. A triumph for 2016. Old vines and a self-proclaimed natural wine."